To bring the benefits of SEL to more students, programs need to be flexible enough to adapt to local needs. In recent years, the science of social and emotional development has flourished. Findings from neurobiology and the study of the stress response system have illuminated how environmental factors such as poverty, chronic stress, and trauma can affect brain development to influence children’s capacity to focus attention, recall information, exercise planning and self-control, and get along with others, thereby affecting their lifelong learning, behavior, and health (Jones, Bailey, & Partee, 2016; National Scientific Council on the Developing Child, 2005/2014; Noble, 2014). As educators understand more about the way toxic stress affects the brain’s ability to manage executive function and regulate emotion, they gain a new perspective on student behavior, which may lead them to pursue new approaches that support social and emotional development as well as academic learning. As our understanding of social and emotional development has grown, so, too, has the number of schools across the United States adopting social-emotional learning (SEL) programs (Dusenbury et al., 2011). This growth is supported by research indicating that high-quality SEL programs can improve students’ academic, mental health, and behavioral outcomes, as well as classroom climate and teacher practices (Durlak et al., 2011). A research synthesis appearing in the December/January issue of Kappan (Mahoney, Durlak, & Weissberg, 2018) confirms the positive effects of SEL interventions and programs and indicates that these effects can endure for up to three years post-intervention (Sklad et al., 2012; Taylor et al., 2017). Empowering teachers to design their SEL instruction makes sense, because they know their students best. The frontier of research in SEL will be to push our understanding of what works, for whom, and under what conditions (see Jones, Farrington, et al., in press). Existing research suggests that SEL programs may be particularly important for low-income students, as they are more likely than their affluent peers to be at risk for social, emotional, behavioral, and academic problems (Evans & English, 2002; Raver, et al., 2013). Furthermore, recent studies find that SEL programs tend to have their largest effects among students with the greatest number of risks, including those with lower socioeconomic status or those who enter school behind their peers either academically or behaviorally (e.g., Jones, Brown, & Aber, 2011). Low sustainability (e.g., often not continued or implemented consistently). Many traditional SEL programs consist of scripted and sequenced curricula that are designed to be used in a weekly 30-minute block, often led by a school counselor or designated SEL facilitator. They tend to be expensive, require significant training and ongoing support, and limit individual autonomy or choice — as adaptations or deviations from the script are seen as threats to program fidelity. While these programs are an important option, schools may have difficulty implementing them as intended, integrating them throughout the day and across multiple settings, and sustaining them over time. Such prescriptive approaches also fail to leverage the expertise of teachers who ultimately know their classroom best, and whose relationships, observations, and decisions are critical to providing effective and timely social-emotional support for students. There is a pressing need for an approach to SEL that is more flexible and feasible to implement, and adaptable to individual and place-based needs, while still achieving meaningful outcomes for children (Jones, Bailey, et al., 2017). In our work with educators across the country, we frequently hear the following: (a) SEL curricula feel irrelevant because they don’t reflect students’ experiences, at times babying, oversimplifying, or ignoring the real challenges students face in their everyday lives; (b) there is not enough time for SEL because of competing academic priorities; (c) teachers and staff do not receive enough support to implement SEL programs successfully or to engage in their own authentic social-emotional growth, and (d) rigid lesson plans don’t allow teachers to respond to students’ evolving needs. In contrast to a one-size-fits-all approach, we imagine an approach to SEL that is developmental, flexible, and responsive to local needs — focused on strategies for teachers to implement as appropriate, rather than a sequenced curriculum for them to follow. Below, we suggest three ideas for reimagining how SEL can happen in schools and in out-of-school time (OST) settings. First, SEL should be organized around a developmental model that identifies specific, age-appropriate skills across preK-12. Social-emotional skills emerge at certain stages of development, and they grow and change over time. For instance, executive functions improve dramatically during the early childhood period, as a result of rapid growth and reorganization of specific regions and networks in the brain (Best & Miller, 2010; Center on the Developing Child, 2011; Garon, Bryson, & Smith, 2008). Other social and emotional competencies are critical during middle childhood and adolescence (e.g., Yeager, 2017). SEL programming should take these developmental stages into consideration, but in our review of 25 widely used SEL programs, we found that the skills targeted don’t vary across grades (Jones, Brush, et al., 2017). 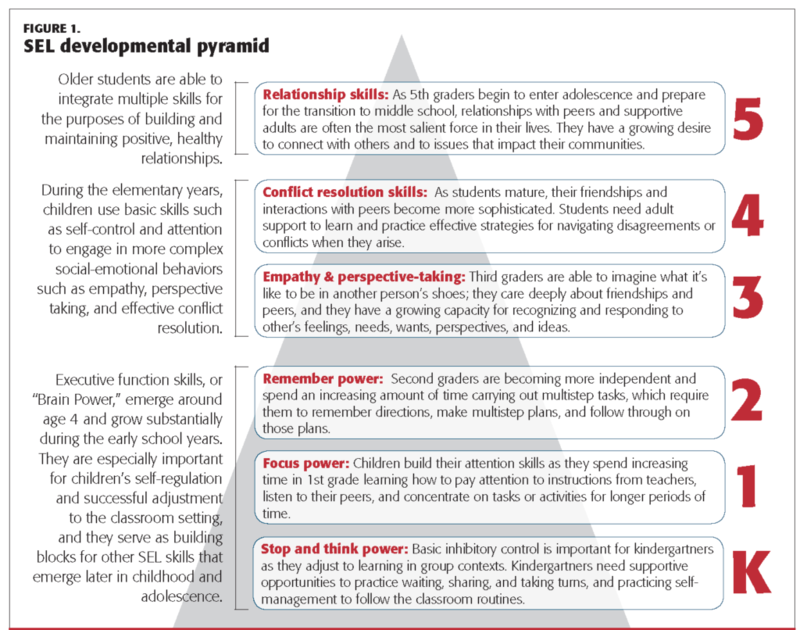 A developmental model should articulate which social and emotional skills lay the foundation for others at which ages, allowing educators to focus on specific skills during salient times rather than trying to do everything at once. We have created an “SEL Developmental Pyramid” (Figure 1) to identify key areas of focus for each grade level and to reflect how skills build on each other over time. Second, SEL should focus on flexible, low-lift strategies and practices, not just curricula. SEL instruction is most effective when children have frequent opportunities to practice SEL skills in various contexts (McClelland et al., 2017). However, traditional SEL curricula are often complex and burdensome to implement, and schools struggle to embed program lessons across the day in various contexts — such as math and literacy instruction — or into daily interactions among peers. A low-lift, strategy-based approach that is flexible enough to be implemented in any context (e.g., hallways, gym, lunchroom, playground, art room) and at any time of day is more feasible and, therefore, more likely to foster schoolwide consistency. Drawing from a content analysis of evidence-based SEL programs, we can identify common strategies and practices — which we consider the essential “active ingredients” that drive change in effective SEL programs (Jones, Bailey, et al., 2017). Focusing on these strategies, rather than comprehensive curricula or scripted lessons, enables teachers and staff to address challenges or opportunities as they arise. As teachers integrate SEL strategies into their daily routines or activities in ways that work for them, students have more frequent opportunities to practice SEL skills. This approach can also increase consistency throughout the school community and smooth students’ transitions between classrooms and grades. Traditional SEL curricula are often complex and burdensome to implement, and schools struggle to embed program lessons across the day in various contexts. Third, SEL is most effective when teachers are responsive to students’ specific needs and experiences. To provide meaningful learning opportunities, educators must plan instruction that reflects students’ lived experiences at school, at home, and in their communities. This is true for literacy, math, SEL, or any other subject. Yet, this can prove to be challenging when trying to implement SEL programs with fidelity. In focus groups, teachers have commented that existing SEL curricula don’t always feel like they are designed for their students; therefore, it can be difficult to generate student buy-in. With a strategy-based approach, teachers are empowered to decide what gets implemented, when, and how. Furthermore, they are encouraged to adapt strategies to accommodate specific student, classroom, and community needs. Empowering teachers to design their SEL instruction makes sense, because they know their students best. We believe that part of this approach includes providing teachers with a range of SEL resources — some offering light support and some offering substantial support — to meet teachers where they are. However, because too much flexibility has the potential to undermine the effectiveness of SEL programs, our recent work has focused on identifying the essential elements of a strategy and clarifying for teachers which elements are optional or adaptable to local contexts, individual student needs, and/or teaching preferences. To explore this new approach, our team partnered with an OST summer program providing six weeks of academic programming to low-income urban preK-8 students. Teachers had the option of using a structure provided by the EASEL Lab (Ecological Approaches to Social Emotional Learning: https://easel.gse.harvard.edu) — comprising age-appropriate strategies described in a packet of resources provided at the training — or creating their own structure with either these same resources or different resources they created themselves or found elsewhere. The strategies we provided spanned the cognitive, emotional, and social domains and included specific, grade-level strategies as well as universal “through-line” strategies that could be used across grade levels. Strategies — such as Brain Games, Feelings Circle, and Conflict Solvers — were adapted from a comprehensive evidence-based SEL program (Jones, Bailey, & Jacob, 2014) but were designed to stand alone; they required no accompanying lessons. Each grade level had a set of slightly different resources designed to foster a grade-specific target skill, and the content was aligned across grade levels to highlight how the target skills are interconnected and to create continuity. Before implementation began, teachers attended a two-hour training led by three EASEL Lab facilitators. At the beginning of the training, teachers reflected on the SEL strategies they already used in the classroom and how students exhibit various SEL skills. They also learned about the foundational research and guiding framework for our approach. In small breakout sessions, facilitators provided an overview of each strategy, offered tips on how teachers might tailor the strategies to meet their students’ needs, and modeled the strategies while teachers participated. Although teachers had been given a structure for SEL programming, the training emphasized that the structure was flexible and that teachers had the autonomy to decide which strategies were most appropriate for their students. Nineteen preK-8 teachers implemented the strategy-based approach with 169 students; there was one classroom per grade level. Throughout the summer, teachers collected daily implementation data about SEL strategies, weekly classroom challenges, and beginning- and end-of-summer reports of student SEL skills. Overall, implementation data suggested that a strategy-based approach to SEL was a feasible and positive experience for students, teachers, and staff. On average, preK-5 teachers used two or three strategies per day, while teachers in grades 6-8 used one strategy per day. Teachers generally followed the recommended plan: Among all SEL activities, 83% in preK-5 and 89% in grades 6-8 were the suggested strategies from the EASEL Lab. On average, teachers were able to complete the strategies in 7–11 minutes, indicating that they could be easily implemented throughout the day. Teachers selected SEL strategies to address particular challenges, and these varied greatly. However, some commonalities did emerge. More than half of the preK-5 teachers identified one of three skills — focusing and paying attention, addressing conflict effectively, and managing emotions — as challenging for their students. Teachers in grades 6-8 reported that students needed support with using self-control, participating as an active member of the community, and demonstrating behavior that fosters friendship. Summer reports about students’ growth on specific cognitive, emotional, and social skills revealed schoolwide improvement in every SEL area. Students achieved statistically significant growth between the beginning and end of the summer across all 13 items on our survey (see Figure 2). 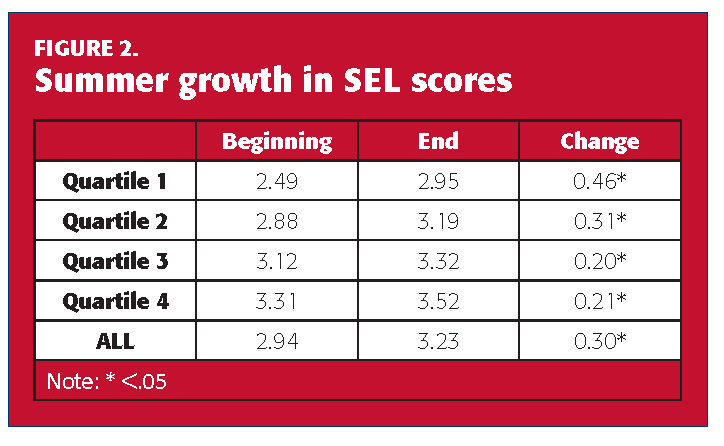 Furthermore, students in the bottom quartile (Quartile 1) showed the most growth; in other words, students who were initially rated lowest by their teachers in SEL skills showed the largest gains over the summer. In addition to submitting weekly surveys, 10 teachers and two administrators participated in focus groups at the end of the summer. The following themes emerged from our analysis. First, the strategy-based approach generated numerous positive responses. Specifically, teachers felt their relationships with students strengthened substantially over the summer as their classrooms became a space for mutual sharing and growth. Teachers also noticed an increase in students’ self-esteem and a decrease in the number of conflicts on the playground. In contrast to a one-size-fits-all approach, we imagine an approach to SEL that is developmental, flexible, and responsive to local needs. Second, teachers felt comfortable adapting SEL strategies and incorporating them throughout the day. At times, they altered the developmental level of a strategy or the amount of time spent on it. They also figured out ways to incorporate the content into math and literacy lessons. Third, teachers appreciated the variety of resources and preferred using the most scripted hard-copy resources, leading us to believe that, while teachers appreciate the flexibility to decide when and how to implement SEL strategies, they also want concrete details about what the strategies look like in practice. The Strategies Pack, which contained detailed write-ups about each of the strategies, was most frequently used, followed by the Daily Outlines, which provided more general guidance about how to implement strategies effectively and flexibly over time. The field of SEL has grown tremendously in the past two decades. As research and policy advance, the practice of SEL must also advance. Traditional approaches to SEL have focused on scripted, lesson-based curricula, and while there is strong evidence of the efficacy of traditional approaches, many schools, OST, and youth development programs do not have the time or resources to implement these programs as designed. To complement existing SEL curricula, we argue that new approaches to SEL are needed. These approaches should be organized around a developmental model of SEL, focus on flexible and evidence-based strategies, and be responsive and adaptable to student needs. Such an approach may increase initial uptake and sustainability over time, thereby maximizing SEL’s influence on children’s learning and developmental outcomes. Related: Joshua P. Starr on leadership: Can we keep SEL on course? Best, J.R. & Miller, P.H. (2010). A developmental perspective on executive function. Child Development, 81 (6), 1641-1660. Center on the Developing Child at Harvard University. (2011). Building the brain’s “air traffic control” system: How early experiences shape the development of executive function (Working Paper No. 11). Cambridge, MA: Author. Durlak, J.A., Weissberg, R.P., Dymnicki, A.B., Taylor, R.D. & Schellinger, K.B. (2011). The impact of enhancing students’ social and emotional learning: A meta-analysis of school-based universal interventions. Child Development, 82 (1), 405–432. Dusenbury, L., Zadrazil, J., Mart, A., & Weissberg, R. (2011). State learning standards to advance social and emotional learning: The state scan of social and emotional learning standards, preschool through high school. Chicago, IL: CASEL. Evans, G.W. & English, K. (2002). The environment of poverty: Multiple stressor exposure, psychophysiological stress, and socioemotional adjustment. Child Development, 73, 1238–1248. Garon, N., Bryson, S.E., & Smith, I.M. (2008). Executive function in preschoolers: A review using an integrative framework. Psychological Bulletin, 134 (1), 31-60. Jones, S.M., Bailey, R., Brush, K., & Kahn, J. (2017). Kernels of practice for SEL: Low-cost, low-burden strategies. New York, NY: The Wallace Foundation. Jones, S.M., Bailey, R., & Jacob, R. (2014). Social-emotional learning is essential to classroom management. Phi Delta Kappan, 96 (2), 19-24. Jones, S.M., Bailey, R., & Partee, A. (2016, September/October). How to target intergenerational poverty with a basic life skill. Aspen Journal of Ideas. Jones, S.M. & Bouffard, S.M. (2012). Social and emotional learning in schools: From programs to strategies. Social Policy Report, 26 (4), 1-33. Jones, S.M., Brown, J.L., & Aber, J.L. (2011). The longitudinal impact of a universal school-based social emotional and literacy intervention: An experiment in translational developmental research. Child Development, 82 (2), 533-554. Jones, S.M., Brush, K., Bailey, R., Brion-Meisels, G., McIntyre, J., Kahn, J., Nelson, B., & Stickle, L. (2017). Navigating SEL from the inside out: Looking inside & across 25 leading SEL programs: A practical resource for schools and OST providers (Elementary School Focus). New York, NY: The Wallace Foundation. Jones, S.M., Farrington, C.A., Jagers, R., Brackett, M. & Kahn, J. (in press). National Commission on Social, Emotional, and Academic Development: A research agenda for the next generation. Washington, DC: The Aspen Institute. Jones, S.M. & Kahn, J. (2017). The evidence base for how we learn: Supporting students’ social, emotional, and academic development. Washington, DC: Aspen Institute, National Commission on Social, Emotional, and Academic Development. Mahoney, J.L., Durlak, J.A., & Weissberg, R.P. (2018). An update on social and emotional learning outcome research. Phi Delta Kappan, 100 (4), 18-23. McClelland, M.M., Tominey, S.L., Schmitt, S., & Duncan, R. (2017). SEL interventions in early childhood. Future of Children, 27 (1), 33-48. National Scientific Council on the Developing Child. (2005/2014). Excessive stress disrupts the architecture of the developing brain (Working Paper 3. Updated Edition). Cambridge, MA: Author. Noble, K.G. (2014). Rich man, poor man: Socioeconomic adversity and brain development. Cerebrum: The DANA Forum on Brain Science, 2014, 6. Raver, C.C., Blair, C., Willoughby, M., & Family Life Project Key Investigators (2013). Poverty as a predictor of 4-year-olds’ executive function: New perspectives on models of differential susceptibility. Developmental Psychology, 49 (2), 292-304. Sklad, M., Diekstra, R., De Ritter, M., Ben, J., & Gravesteijn, C. (2012). Effectiveness of school-based universal social, emotional, and behavioral programs: Do they enhance students’ development in the area of skill, behavior, and adjustment? Psychology in the Schools, 49 (9), 892-909. Taylor, R., Oberle, E., Durlak, J.A., & Weissberg, R.P. (2017). Promoting positive youth development through school-based social and emotional learning interventions: A meta-analysis of follow-up effects. Child Development, 88, 1156–1171. Yeager, D.S. (2017). Social and emotional learning programs for adolescents. Future of Children, 27 (1), 73-94. Citation: Bailey, R., Stickle, L., Brion-Meisels, G. & Jones, S.M. (2019). Re-imagining social-emotional learning: Findings from a strategy-based approach. Phi Delta Kappan, 100  (5), 53-58. REBECCA BAILEY (Rebecca_bailey@gse.harvard.edu) is assistant director of the EASEL Lab (Ecological Approaches to Social Emotional Learning) at the Harvard Graduate School of Education in Cambridge, Mass. LAURA STICKLE (laura_stickle@gse.harvard.edu) is a project coordinator at the EASEL Lab (Ecological Approaches to Social Emotional Learning) at the Harvard Graduate School of Education in Cambridge, Mass. GRETCHEN BRION-MEISELS (gretchen_brion-meisels@gse.harvard.edu) is a lecturer at the Harvard Graduate School of Education in Cambridge, Mass. STEPHANIE M. JONES (jonesst@gse.harvard.edu) is the Gerald S. Lesser Professor of Early Childhood Development at the Harvard Graduate School of Education in Cambridge, Mass.